This is a unique and informative utility for students and professionals alike. Aqueous acid-base equilibria can be studied from multiple perspectives, leading to greater insight and understanding. This is a great way to learn how subtle differences in chemical structure can change chemical reactivity. Often only one form of a molecule participates in a reaction and the fraction of that form can change significantly with small changes in local pH. 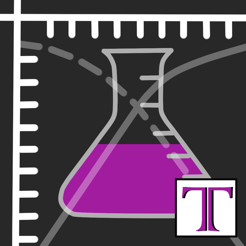 For most analytical chemistry problems, this app will get you further than you'd hoped, in less time than if you'd guessed! * to know the pH of a buffer solution? 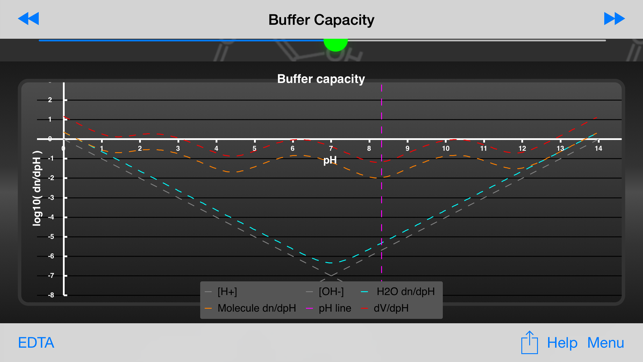 * to know how to make a buffer with a specific pH? * to know the endpoint of a titration? * to know which indicator to use? * to know the titration error for a given indicator? * to know the midpoint of a titration? 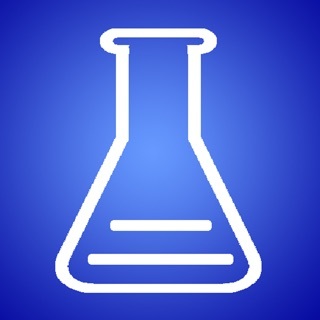 * to know the pH of a specific salt or acid solution? * to know the sensitivity of a solution to pH changes? * to know the effect of multiple equilibria on pH and composition? * to show someone the complex interactions among multiple equilibria? The answer could literally be in your back pocket! Even for tetra-protic acids such as EDTA. This is a tool for beginning students and professionals alike. It is a tool you will grow into, but not outgrow. 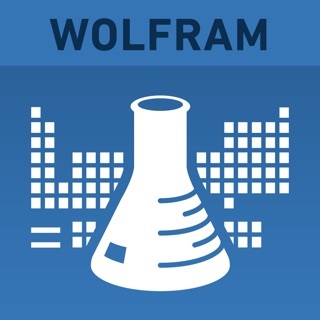 This app has 13 pre-programmed analyses and displays the results both graphically and numerically. The calculations are based on the full coupled equations, which are supplied in the help section. These preprogramed analysis serve as reminders and guides to interpretation of results and ultimately, are a teaching tool for how to get the most value from the app itself. More than 80 molecules are included. 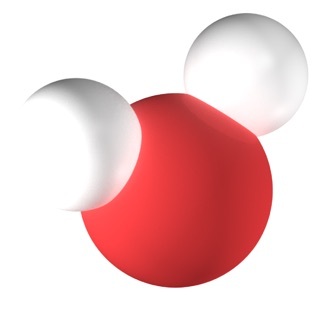 These can be used 'as is' or can be a starting point for exploring other molecules. in Explore mode, the number of acid groups and pKa can be modified at will. 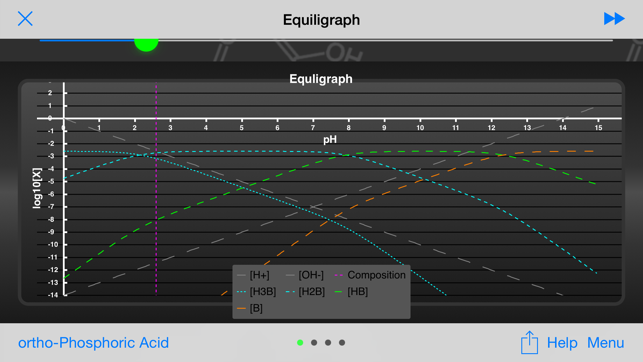 The equiligraph is a time tested way of solving complex equilibria problems of both pure solutions and mixtures of poly-protic acids and bases. 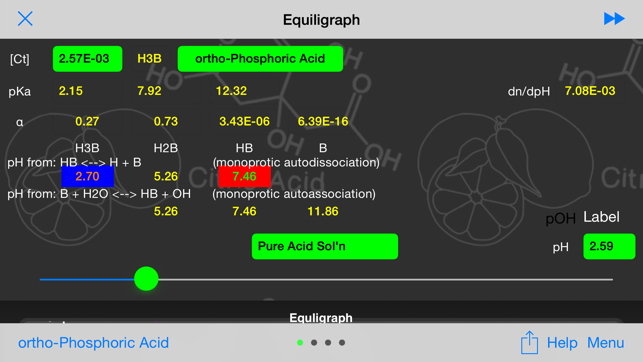 These graphs are extremely useful for explaining complex interactions between chemical species ( see http:// www.tahosa.us/Equiligraph ). There really is no better way to understand acid-base equilibrium than to see how composition changes over a broad pH range. This tool provides that global perspective. A half an hour with this app could save you an afternoon in the library and could even save you 6 months in the laboratory. 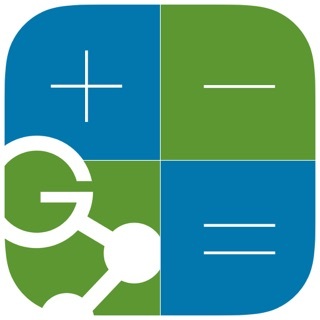 You probably have an epiphany or two every time you use this app! 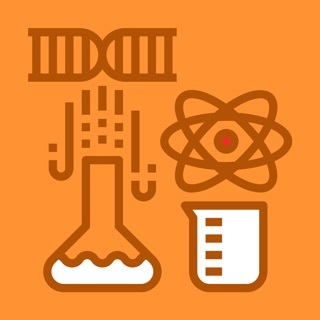 This app will help you avoid blind alleys and lost time in the laboratory. A free trial version includes several common molecules. 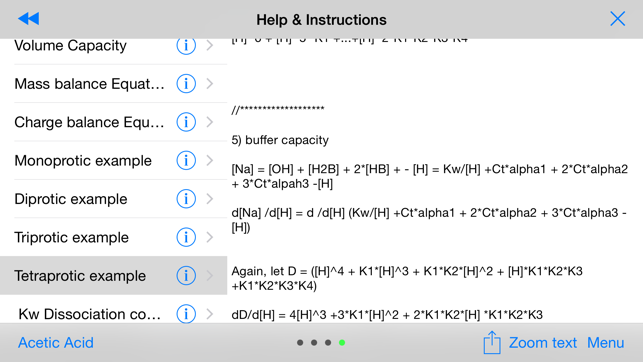 Full app function is available for these molecules, except for the ability to change pKa or change the number of protons. 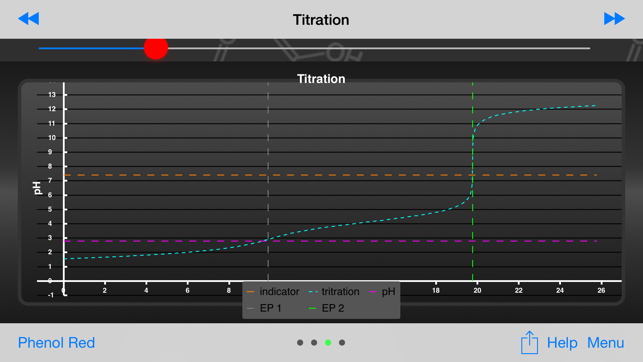 Allows one to easily see the relationship between acids and bases. Easy to adjust concentration and see the impact.